The true flat screen and Stainless housing provide a rugged and elegant solution for industrial harsh environment. 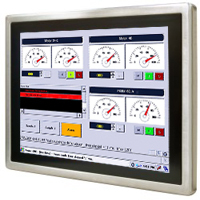 Resistive / P-Cap touch providing accurate touch control for the users. Accompanying Intel Celeron N2930 processor provides user a stable and high cost efficiency solution.